Green Acres School is committed to outdoor learning—teaching the understanding of and respect for the natural world. We use our entire 15 acre campus as our classroom, extending lessons to the woods, streams, playgrounds, and athletic fields. Our teachers and staff routinely work with our students to compost, recycle, and tend gardens. In many ways, students not only enjoy the outdoors, but also develop a healthy sense of preservation and stewardship for the environment. In the Early Childhood Unit, time outdoors is a significant part of our youngest students’ school day. 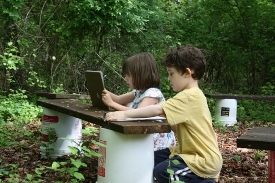 Children explore and play in ways that help them better understand the natural world. In small groups with teachers, they visit various school playgrounds on our campus and follow paths through the surrounding woodlands. Off-campus field trips to places like local parks, nature centers, theaters, libraries, and the zoo further expand their appreciation of nature. Our Lower School and Middle School students spend time in the woodlands, stream, gardens, and fields of our campus, observing natural science at work. In Grade 4, students end the year with an outdoor education trip to Hard Bargain Farm, which helps solidify their understanding of the environmental impact of both nature and humans. We have been working to “green” the School for many years. Following a two year application process, Green Acres was recognized as a certified Maryland Green School by the Maryland Association of Environmental and Outdoor Education (MAEOE) in 2015. Our community promotes awareness of environmental stewardship, conservation, and acting as a catalyst for change. Every day at our school we teach our students to respect our environment. Whether it’s by working together to compost and recycle, asking students to prepare natural decorations as event centerpieces or having our staff select green caterers, we teach our students to preserve our environment for the future. To celebrate Earth Day, Green Acres students and staff work together on an array of special earth-friendly activities. In recent years, mixed-age groupings planted gardens with vegetables to be harvested for next year’s soup kitchen, collected bicycles for Bikes of the World to ship to countries with few resources, planted a garden to provide nectar for butterflies and foliage for caterpillars, and learned how different parts of the world manage their water resources through water simulation exercises. Another group created a magnificent outdoor nature mandala to remind all of the beauty of the natural world. This is just a sampling of the many hands-on activities in which students participate during Earth Day. In Grades 3 and 4, our Lower School Science and Technology teacher asked her students to learn about global environmental problems and endangered animals, and then to look around the Green Acres campus to identify things that they can do on a local level to help effect meaningful change. Students collaboratively identified climate change and endangerment of butterflies and bees on our campus. This project required direct action by students. Their assignment was to plan a project and to implement it. Working in groups students identified erosion, waste, and habitat destruction as the local problems they could address to improve the climate change and endangerment of bees and butterflies. Having learned that run-off is responsible for polluting the Chesapeake Bay, they saw erosion on the hill between the Center and the Kids’ Field as a contributing factor and designed a terracing plan to stop it. With the help of the maintenance crew, students planted native grasses to trap run-off and thereby to stop the erosion. Creek walks have long been a primary activity for environmental learning at Green Acres. Clad in boots, carrying bags to collect debris and probes to collect water samples, students helped to clean-up our creek. They collected and tested water samples. Having learned how to compost, students encouraged the School to purchase two additional compost bins for the 3/4 building. They learned about how Wooly Pockets can be used to retain rainwater for plants, and installed two large pockets along campus fencing, in which plants that support bees and butterflies now are growing. The efforts of our young stewards of the earth resulted in tangible improvements to help to reduce climate change and to preserve bees and butterflies.